A customer was asking me today about our warranty. Well, on the back of our Bill of Sale (which covers everything) it says 10 years. But there are a lot of other products with a 25 year warranty, especially in our data line. 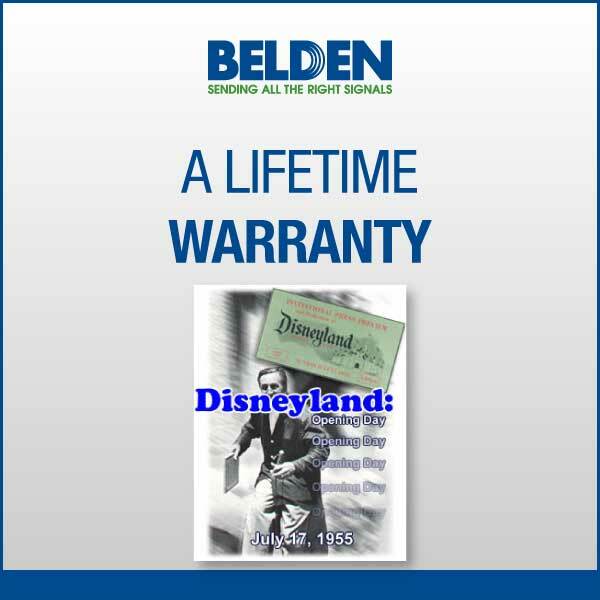 We even have some products, like Belden 1872A “MediaTwist”, with a lifetime warranty. “You mean FOREVER ?? ?” said an incredulous European Belden salesperson. Well, sure. That warranty says we made the cable the way we agree to make it. And if it turns out that we made it wrong and it fails, we’ll replace it for free. It’s definitely something that motivates us to make it right the first time. Of course, sometimes we make it even better than that, or a customer just assumes that our cables are the best (thank you very much) but then does things that the cable was never designed for. And this leads to my story. We got a phone call not so long ago from a theme park. (I’m leaving out the name but will drop some clues.) One of our cables had failed. Well, this is a major customer and our cables don’t fail very often, so we visited them to see what was happening. The cable was one of our old standbys Belden 8760. This is one of the most popular Belden cables of all times. It is an 18 AWG twisted pair, polyethylene insulated, with a foil shield and drain wire, and a PVC jacket. People have used this for almost every application, from microphone level signals to speaker cable to DC power, you name it! The one that failed in the theme park carried balanced-line audio. We asked the engineer where it had been installed. He pointed to a lake in the park, a lake with an island in the middle. The audio went to the island. “You mean this cable was put under water?” the Belden salesperson asked. “Well, of course,” said the engineer. This was Belden cable, after all. “But 8760 is not for direct burial, not intended to be used underwater,” said the salesperson. The engineer looked blankly back, After all, it worked. “How long was it in there?” asked the salesperson. The engineer had to think for a few seconds. “I guess that cable was installed when the park was built,” he finally said. “When was that?” the Belden salesperson asked. “1955,” said the engineer, matter-of-factly. Of course we now make water-blocked and direct burial cables. If you’re looking for a direct-burial version of 8760, check out Belden 5300F1. If you’re putting a cable where it’s wet, this is what we would recommend (or one of many other variations). But don’t expect us to guarantee it will last 60 years…. Do you have a story about an amazing experience with Belden cable? Why not share it with us. SKY RG6 Coax: No More Sticky Fingers!